Hugo Chavez was born July 28th, 1954. He had been in the Venezuelan military, he served as an army officer. He participated in overthrowing the government in 1992, with this failing he was jailed for two years. Chavez had eventually became president in Venezuela in 1999. The first thing Chavez did was create a new constitution and changed the name of the country to the Bolivarian Republic of Venezuela. While in office he wanted to control the state-run oil company this had led to protest in the country. Also this caused issues with the United States and he was removed from power briefly. While in office Chavez had sold oil to Cuba and in 2006 he helped create the Bolivarian Alternative for the Americans this was a socialists free-trade organization. He eventually died March 5th, 2013 at the age of 58 battling cancer. This picture of Chavez on a side of a building shows that he was a part of everyday life when he was a leader. He had people paint these pictures to show that they care about Chavez and that he is the supreme ruler just like what people did with Mao. Also the fact that the picture is still around shows that theres still part of the country hat care and worship what Chavez had done for the country. 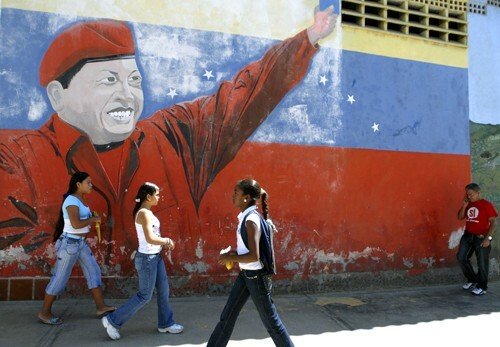 By putting his picture on a building helped Chavez get recruits and more people to follow him. He was smart about this and he had a large following because of it. You took our country so quickly, planning on overthrowing the government for awhile and being in jail did not stop you from becoming president. You almost ruined our chances of being in an alliance with the United States through your own doing because you wanted control over the oil. Also you created a new constitution for us to live by yet you changed the countries name, none of the citizens really understood why you had done that, yet we never questioned that. You have created some great groups through your rule and did help our country of Venezuela. I just want to say thank you for what you did even though sometimes we did not agree with what you were doing we allowed you too. Was Hugo Chavez really a threatening leader in Venezuela?